On January 28, I went out to the Sax-Zim Bog with my friend Bruce Pomeroy. We both wanted to see some northern specialties for the new year, plus I was scouting out the area because I’ll be taking a friend from Florida there this weekend and want to find as many northern birds as I can for him. The temperature was mild—it stayed at exactly 27 degrees during the 5 hours we were there—but it was windy and murky all day. Except at or near the main bird feeding stations, we didn’t see all that many birds, but the ones we saw were wonderful and we had a splendid day. Usually I drive into the bog via Highway 133—the road into Meadowlands—but you can’t drive very slowly because traffic is pretty steady. So this time I followed the winter driving tour route that my friend Ben Yokeldeveloped and posted on the Friends of Sax-Zim Bog website. That route brought me in via Lake Nichols Road, a mile or so north of Hwy. 133. Along that road we had a nice flock of Pine Grosbeaks and Purple Finches, and got into the spirit of winter bog birding. 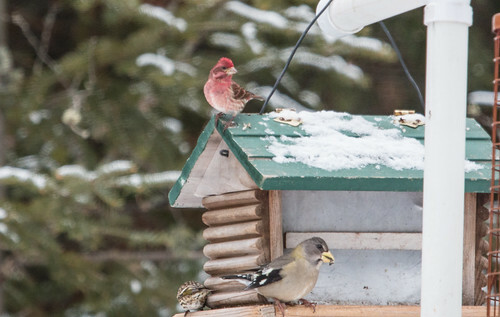 A few people who live in the bog have been maintaining splendid bird feeding stations open for public viewing, volunteers maintain a few roadside feeders, and there’s a fantastic station at the new Friends of the Sax-Zim Bog visitor center on Owl Avenue. Most of these are clearly marked on the map available for free at the visitor center. The feeding station there was the best we saw all day. 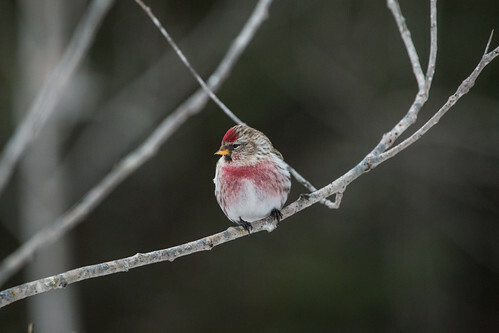 We had at least 150 Common Redpolls and a pair of Gray Jays as well as the usual winter birds. We went inside to warm up and visit with Frank Nicoletti, who is the host on Tuesdays and Wednesdays through mid-March. Frank is a professional owl bander and bird guide, and is exceptionally generous with information, so he’s an amazing resource. Frank sat down with me and went over all the hotspots he’s been bringing people to this year. Since I’ve spent so little time in the bog in the past few years, his advice was especially welcome. A few deer hunters donate rib cages to the Friends of the Sax-Zim Bog organization, and some of these were set up near the visitor center, to draw in special birds. Two Gray Jays spend a lot of time feeding on and even inside the ribcage closest to the windows. Some of the carcasses in the bog also have attracted ermines this year—these weasels in their pure white winter pelts are especially beautiful, but it takes patience and time to see and photograph one. I’m still waiting for that. Looking out the windows from the center, we not only got great looks at those Gray Jays and Blue Jays, but also enjoyed a constant flurry of activity by redpolls at the feeders. Evening Grosbeaks are far rarer than they were in the 1980s, but have been showing up in more places this winter than in the past few years. We didn’t get all the way to the area shown in the northwestern corner of the bog map, so missed what’s called “Mary Lou’s Feeders” which are supposed to be a grosbeak bonanza, but we’ll certainly get there this weekend. In mid-afternoon, we headed down Admiral Road to check out the birds at the feeders along the road. It was quiet—I didn’t bring peanut butter, and the Boreal Chickadees and Gray Jays in the area only seem to come in for that—but our biggest treat of the entire day came on that stretch of road, even before we got to the feeders. 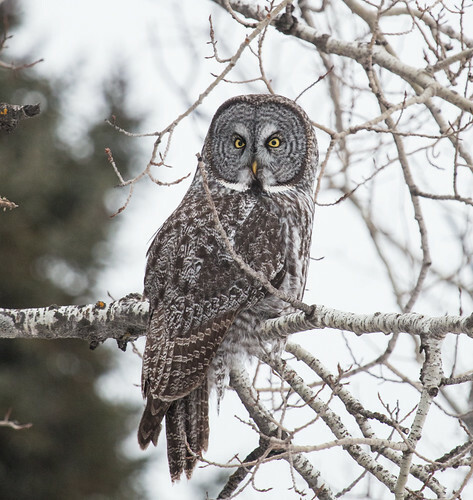 A Great Gray Owl sat in a tree. Three or four birders were photographing it when we got there, so we couldn’t have missed it, though it was sitting in some spruce branches at exactly the height I was searching trees as I drove, so we probably would have seen it even without them. The bird glanced our way a few times. A Great Gray’s glittering eyes make even the most casual glance seem far more intense and meaningful than it probably intends, and it was mostly looking this way and that, actively hunting. It moved down the road, and after a few final photos we left it to hunt in peace. Bog birding always provides a splendid feast, but the memories are somehow even more satisfying when we save the dessert for last. Every year at the end of January I start considering whether I made the right New Year's resolution, and how well I’m sticking to it. Last year I decided that this would be the year I committed to using eBird—a wonderful program created by the Cornell Lab of Ornithology and Audubon designed to help birders keep their own personal records while sharing their data with scientists, conservationists, and the larger birding community. Unlike other bird-listing programs, eBird is free, and anyone can access it to contribute their data online at eBird.org. Getting started on eBird is a little tricky, because for our data to be valuable, we have to keep track of a lot of details, including not just which species we saw on a particular day but how many individuals of each species we saw, and exactly where and when we saw them. I’m nowhere near as disciplined at keeping a field notebook as I used to be, so it’s very hard to come home and remember all these details. Over the past couple of decades, when I'm out birding I've become more focused on fun interactions with birds, photographing them, explaining identification and behavior to field trip participants, and thinking about story ideas. Fortunately, the eBird team developed a really slick app for iTunes and Android called BirdLog for adding our sightings as we go, using our phone’s GPS and clock. The North American edition is $9.99, and the edition covering the entire world is $19.99. 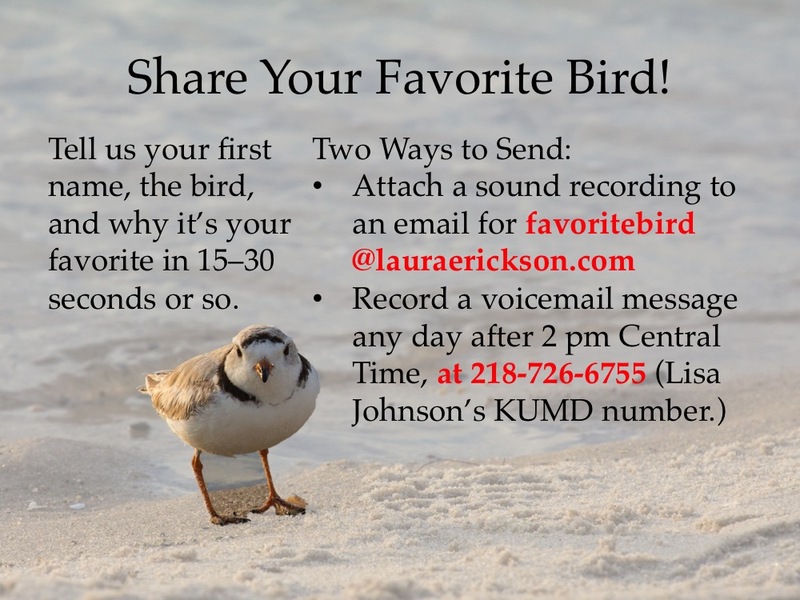 BirdLog is quick and easy to use, after a minor learning curve—the trick is getting into the habit of using it. I wanted to make every sighting of a bird this year 100 percent accounted for on eBird, so last fall I started, in a rather haphazard way, to start keeping a daily checklist of the birds I see out the window while I’m working at home, using the BirdLog app. My little chickadee missing the front toes on his or her right foot. 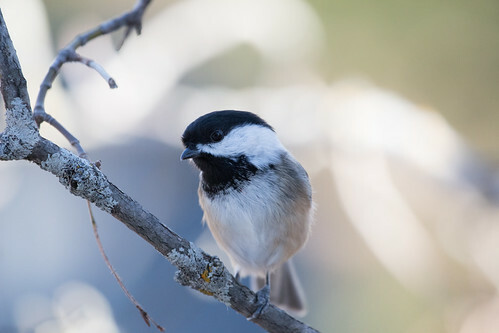 The trickiest birds to count are of course chickadees. They come in one by one, grab a seed, and fly off to eat elsewhere, so we never have the whole flock in one spot to count easily. I must have at least two different winter flocks visiting my yard—I recognize one individual chickadee who is missing his or her front toes on one foot. When that bird's flock arrives, that individual chickadee alights on my window feeder and makes various calls to get my attention. When chickadees arrive and that bird isn’t with them, I know it’s a different flock. I may actually have two or more flocks that don’t include that individual—there’s no way of being absolutely certain—and once in a while I have so many chickadees at once that I figure I must have both flocks at the same time. My best guess is that the individual flocks have 7 or 8 members, so I usually estimate my chickadee total for the day at 15. As we approach the end of January, I’ve only missed recording birds two days all month—both days when I was so busy that I hardly looked out a window at all. I am still working on my eBird skills out in the field. When I’m at the Sax-Zim Bog, for example, it’s far more valuable for researchers to know exactly where in the bog each bird was, so entering the data on separate checklists for each specific area is better than just entering one checklist for the whole bog. Thanks to the BirdLog app, keeping track of all that is much easier, as long as I stay reasonably focused. I’m working on a couple of big projects right now, but when I have them out of the way, I’m going to start entering data from previous years. This data will be entered in eBird’s “historical” category. Back when we were living in Madison Wisconsin in the 1970s, I kept fairly good records, including the number of individuals of many species seen on many days—that data will provide valuable comparisons with numbers being seen nowadays. It’ll take a long time to enter 40 years of bird sightings, but meanwhile, I now seem to be in the habit of entering my eBird data as I go. It's still going slower than it should, but my skills are steadily improving, and this year’s New Year’s resolution turned out to be easier than I expected. 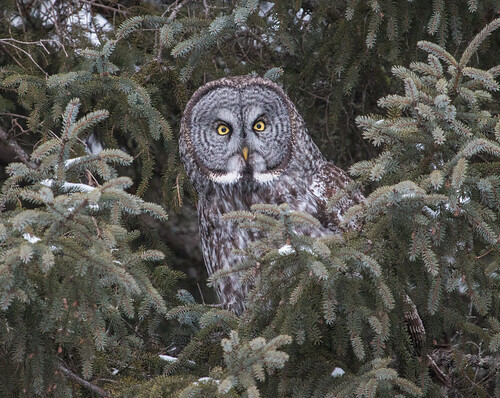 Great Gray Owl in the Sax-Zim Bog. I've seen lots of these over the years, but this is only the second one I've entered into eBird. 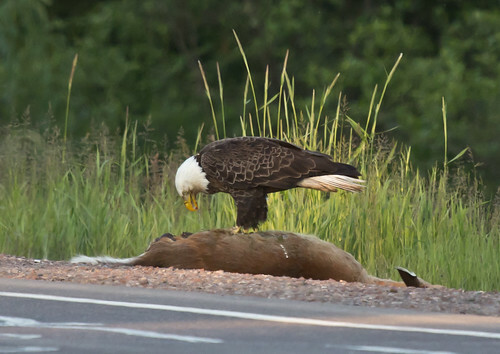 Bald Eagles attracted to any form of roadkill are more vulnerable to being killed by cars, too. When I was researching 101 Ways to Help Birds, I grew increasingly discouraged about the many, many ways our civilization harms birds. 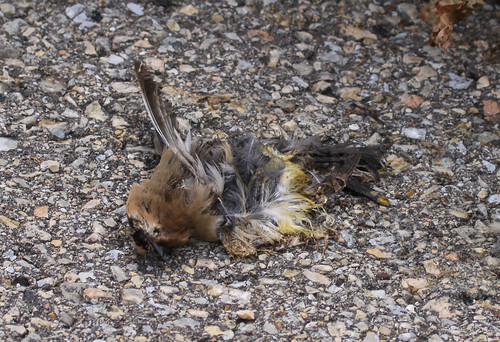 People have been abysmally slow to do anything about even the most obvious causes of avian mortality, such as how very many birds and other wildlife are killed in collisions with automobiles. My daughter and her partner Michael got gruesome confirmation of the magnitude of the problem when they bicycled from San Diego to the Florida coast in 2008, photographing all the roadkill they came across. They wrote about it, and the photos are available at http://roadkill.michaelgeraci.com/. In May 2014, researchers of an important study assessing the death toll published their findings in The Journal of Wildlife Management. They reviewed the literature and used 20 mortality rates they’d extracted from 13 studies to more accurately quantify the mortality. They determined that the estimated bird kill in car collisions is much higher than previously believed, with a lower limit of at least 89 million, and as many as 340 million birds per year. 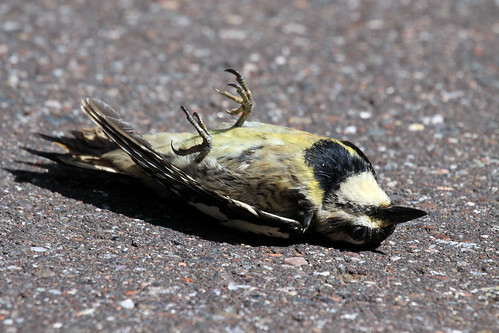 To me, it’s always been rather a no-brainer why birds get hit. No natural predators achieve the speeds that many autos do, at least not in most areas, and of course naïve birds would have no clue what cars even are. And whether it's the noise or sight of a car, the reactions of other birds, or simple random chance that makes a bird fly off in time to avoid a collision, it isn’t necessarily a learning experience in and of itself that can easily be generalized. 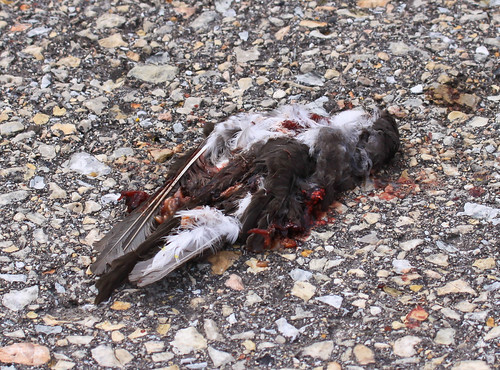 It’s not as if birds are the only wildlife that are killed by cars. Intelligent mammals, including mountain lions and foxes, are also killed by moving vehicles, as indeed are humans—and we’re the ones who from infancy experience and learn to understand cars. Scientists have been trying to work out the exact reasons why birds so often are killed in collisions with cars and airplanes. In one study for the Royal Society for the Protection of Birds released in December 2014, scientists set up Brown-headed Cowbirds in a virtual reality set-up, with a projected virtual car approaching at various speeds. They found that avoidance behaviors of the cowbirds were based on the birds’ distance from an object rather than its speed, so as the speed increased, the birds didn’t initiate flight soon enough and would have collided had the vehicles been real rather than virtual. A somewhat similar study published in PLOS ONE in February 2014 used Turkey Vultures lured to roadsides with bait carcasses and real vehicles to establish that the birds flew off fairly easily in response to approaching vehicles going 37 miles per hour or slower, but when vehicles approached at 55 mph, the vultures didn’t take off in time 17 percent of the time. 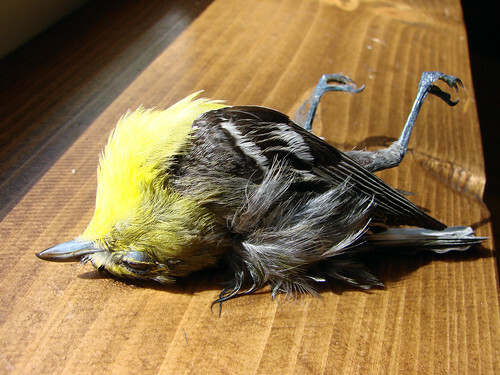 On his webpage, David Sibley writes, “There’s not much we can do about this source of bird mortality short of changing our driving habits, but landscaping the roadside to discourage birds from congregating there is helpful.” But his “short of changing our driving habits” is the operative phrase. One of the simplest yet most effective ways we can help birds is to drive at the slowest speed that is safe, courteous, and convenient. That little change both gives birds and other animals more of a chance to react and gives us more of a chance to adjust our driving to safely accommodate them. Slowing down also significantly improves our fuel efficiency, saving us money, reducing emissions, and conserving natural resources. When everyone slows down, it’s also safer for people, so it’s win-win on every front except for alleviating that infernal need to speed that every element of our modern world fosters. 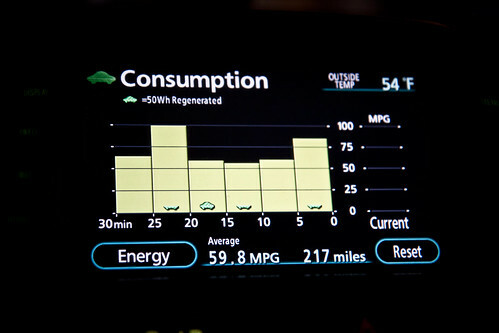 My Prius gets its best mileage when I can drive 42 mph on country roads. Unfortunately, that's neither safe nor courteous on stretches where other cars are going faster. Right now, as Wisconsin debates raising its highway speed limit to 70, I fervently wish our country had the same sense of urgency to conserve natural resources—for environmental, economic, and national security reasons—that Congress and President Nixon did with the 1974 Emergency Highway Energy Conservation Act that prohibited speed limits higher than 55 miles per hour. David Sibley may be right that the American people will never be willing to change our driving habits, no matter how compelling the reasons. But I can only speak for myself—and that is why I always try to drive at the slowest speed that is safe, courteous, and convenient. It’s the right thing to do. 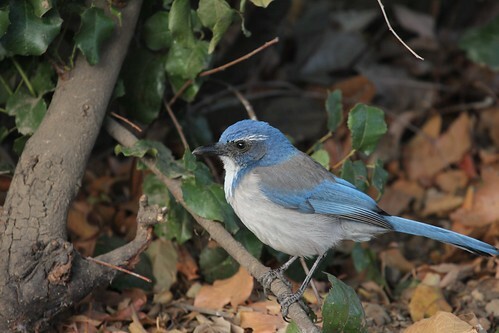 Back in 2012, a paper in the journal Animal Behavior presented a study about Western Scrub-Jays titled “Western scrub-jay funerals: cacophonous aggregations in response to dead conspecifics.” Researchers placed several objects, including pieces of wood, stuffed scrub jays, stuffed Great Horned Owls, and dead scrub jay carcasses, into people’s backyards to observe how the neighborhood scrub jays responded. Jays are naturally curious, and they discovered and inspected all the objects, though spent very little time checking out the wood. Dead scrub jays that had been stuffed and mounted in life-like poses elicited aggression. I’ve often noticed that sociable birds seem more distressed and aggressive toward a bird of their own species when that bird looks or acts different from the others. When I rehabbed, I could never let an injured crow out in my yard, because neighborhood crows would attack it. Intriguingly, many published observations as well as my own find that when a crow is injured or has a physical deformity, its family and neighborhood flock mates do not attack it, but often actually provide help, bringing it food and protecting it from nearby predators. But the combination of being a stranger and acting odd elicits aggression in crows, much as many of our own species have trouble dealing with people who look or act different from them. Something that looks like a perfectly normal jay but doesn’t move or react to others would seem pretty odd to jays who have never experienced such a thing before. 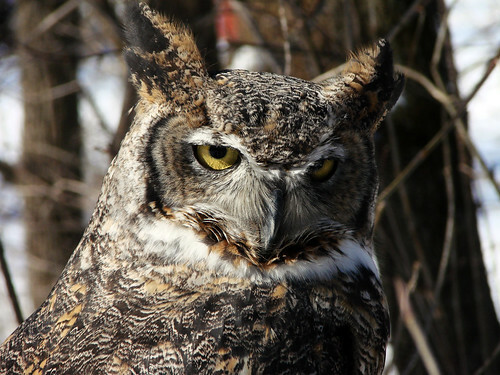 A stuffed and mounted Great Horned Owl elicited “hundreds of long-range communication vocalizations.” Squawking to beat the band calls in squads of other scrub jays, as the birds alert one another to the danger and work together to drive the predator away. 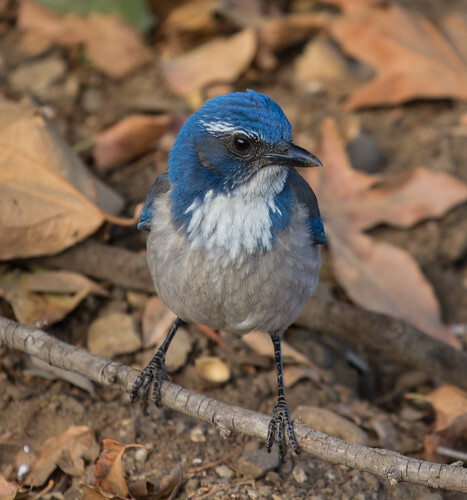 Intriguingly, the researchers found that a prostrate dead jay also got a similar response, both in the high number of calls and in drawing in other scrub jays from afar. I noticed something similar with Blue Jays, back in the days when I was an occasional counter at Hawk Ridge. If a hawk nailed a Blue Jay out of a flock of migrants, the whole group remained in the area, often for 45 minutes or longer, yelling their heads off in what I called an Irish wake. For some reason, a story about that research paper went around on Facebook last week as if it were new information, and several birders quickly started criticizing the authors’ use of the word “funeral.” That and my own use of “Irish wake” naturally smack of anthropomorphism. We humans can’t help but compare animal behaviors to our own. It is completely unscientific to draw a conclusion that animals grieve the loss of individuals or recognize death in the same way we humans do, but it’s equally unscientific to state that they don’t. In the study, those Western Scrub-Jays were hardly grieving the loss of one of their own—the authors didn’t kill a local jay for their dead specimen, so of course the jay wasn’t recognized as a particular individual, and the jays’ reactions almost certainly couldn't be called grief. But the ways we humans announce and gather after the deaths of our own conspecifics suggest that our funerals may serve the same purpose as the gatherings of those scrub-jays. We can’t yell as loud as they, but we ring the alarm far and wide in the obituary pages of our newspapers and on the news. Our own funerals involve family and close friends grieving for the loss of someone they love, but also include the wider community, many who are not grieving at all. If you listen in on conversations at any wake or funeral, you’ll hear people, including genuinely grieving loved ones, talking about the cause of death in ways that suggest we’re all using that information in hopes of forestalling our own deaths, just as the scrub-jays of the study apparently did. Some people pooh-pooh the idea that animals are capable of understanding death or envisioning their own. But we have plenty of evidence that a lot of humans, and not just reckless teenagers, can’t envision our own mortality or wrap our own heads around the concept of death, either. Lots of data affirm that some species of birds and mammals suffer physiological stress after the death of a mate or young similar to the physiological stress of grieving humans. It’s fun to think we’re superior to animals and capable of deeper love than they, but considering the high murder and divorce rates between family members in our own species, that superiority is pretty questionable. Every species reacts to different things in different ways—including us—but we share a lot of common ground. Dismissing the term “funeral” for the scrub jays in this study seems to deny that truth. If we ever came upon intelligent life forms in outer space, there is no way we could hope to communicate with them until we figure out how to better understand and communicate with the intelligent life forms right here on earth. My trusty Golden Guide, which made me lust to see an Ivory Gull. On Friday, January 2, there was a post on the ABA Rare Bird Alert on Facebook that an adult Ivory Gull had been seen down in Quincy, Illinois, over 650 miles away. I had just had some basal cell carcinomas removed from my face and plastic surgery to close the wounds a few days before, and couldn’t go anywhere while the stitches were still in, and then wasn’t supposed to be spending time in the cold or sun for a few weeks. I consoled myself with the thought that it probably would have moved on by the next day anyway. But it didn’t. Hour after hour throughout the weekend, and then every day the following week, people added photos and jubilant posts to the rare bird alert. By Friday the ninth, my frustration level was at the boiling point. Only two weeks earlier I’d chosen not to drive a mere 50 miles from New York City to see two potential lifers—Pink-footed and Barnacle Geese—and didn't feel the least bit cranky or deprived about them. What was the difference? 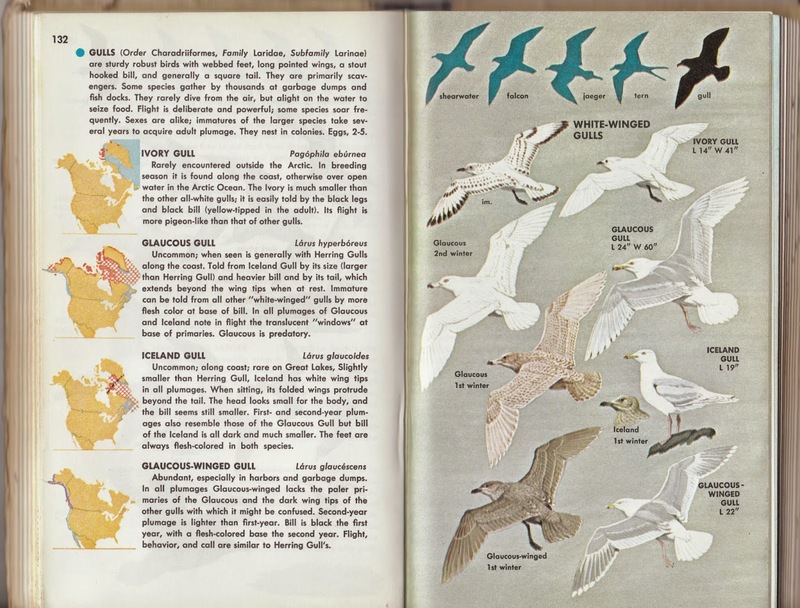 I’d been fixated on the Ivory Gull since first looking through my field guides in 1974. The pristine whiteness of the plumage, contrasting beautifully with the black legs and feet, the dark eye ringed with red in breeding plumage, and the improbably yellow-tipped beak were cosmically appealing to my eyes. Most of these birds never move south of the Arctic Circle, yet one or two individuals may wander south to show up in the US like unexpected grace notes. Their mysterious habits and allure somehow filled me with a deep longing from the time I started birding. Seeing an Ivory Gull would be far, far from a mere entry on my lifelist. It would be experiencing genuine magic. 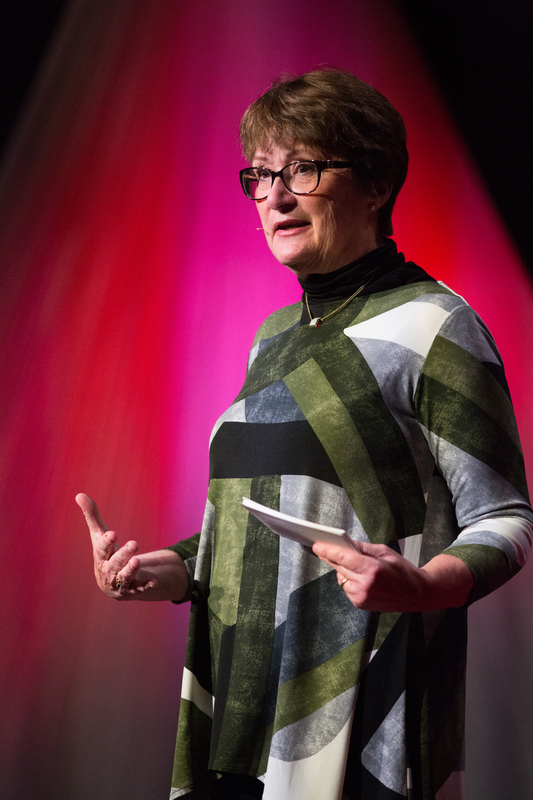 And throughout the week, as I read Facebook posts by more and more people experiencing that magic, I was feeling increasingly trapped and frustrated. 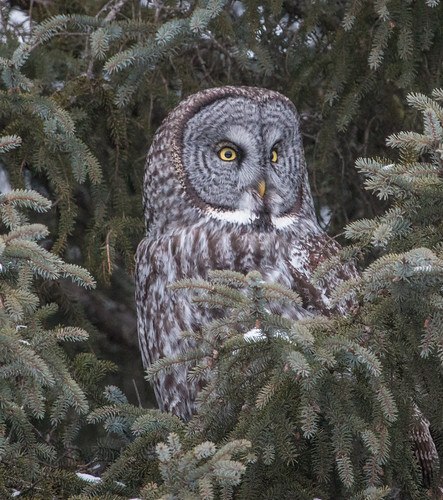 Then on Friday afternoon, one of my birding acquaintances from the Twin Cities, Tony Lau, posted on the Minnesota birding page that he was interested in driving down to Quincy at about 5 o’clock the next morning, and wondered if anyone wanted to carpool. He was hoping to make the trip in one day. Even as I impulsively emailed him right back, my brain was calculating the 155 miles in my car to Otsego—I’d have to leave by 2:30 to get to his place in time for us to start out on the 532 mile trip to Quincy. Tony’s round trip would be 1064 miles—a long day not even counting birding time. And my trip would be 1374 miles. The longest “chase” I’ve ever made for a single rare bird before this was to East Grand Forks in 1988 to see a Brambling that had turned up at a feeder—that trip was about 265 miles each way, with four of us carpooling. I’d not have driven to Quincy, Illinois, to see a Brambling. But this—this was an Ivory Gull. I have a personal rule about chasing rare birds—I hardly ever do it at all, but when I do, I need to be sure the experience of traveling and looking for the bird will be reasonably satisfying even if I don’t see it. It’s always a crapshoot—if you absolutely must see a particular bird, you’re wisest visiting a zoo or museum. The hope of seeing a new bird provides the motivation to get going, but if that hope morphs into need or expectation, you’re doomed. The delight of finding it is lost when you expect it, and the disappointment if you miss it is worse. Some birders do have a sense of entitlement about seeing every good bird, but most of us accept the risks of chasing like any good poker player. And if you like seeing all the other birds along the way, you win either way. From the start, this particular chase looked like a good idea. 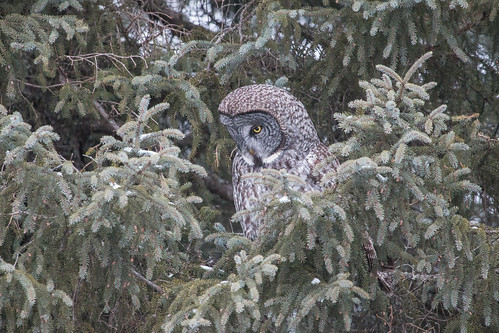 Tony’s a nice guy, so I knew I’d be in good company, and since it was only the second week in January, I knew I’d be seeing plenty of new birds for my 2015 list, including some I’d not likely see for months in northern Minnesota. Because we came up with this plan late Friday afternoon, I didn’t have time to think much about it before heading to bed early, my alarm clock set for 2 am. My drive to the Cities in the dark was uneventful, and utterly devoid of birdlife. When Tony and I got on the road just after 5, it was still too dark to see any birds until we’d reached the Iowa border. We saw a flock of Snow Buntings mixed with other birds—either longspurs or larks, but I didn’t get a long enough look to be sure. We saw lots and lots of Bald Eagles, and our first American Kestrel, too—we added another in Missouri. I was trying not to jinx us by checking Facebook on my phone, but when I finally checked the postings at mid-morning, the news wasn’t good—no one had found it yet, though at least 200 birders from all over the country were searching. My first Illinois Eurasian Tree Sparrow! We made it to Quincy around noon, and birded every spot we’d read about, checking Facebook every few minutes to see if anyone else had found it. 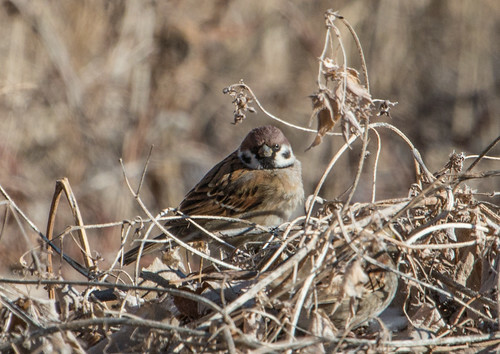 At one spot by a marina on a small island where people were staring out so hopefully, we took a short walk to a brushy area where we saw White-throated, Fox, and Song Sparrows, along with several unexpected Eurasian Tree Sparrows. I was thrilled—that was the first time I'd ever seen them in Illinois. We kept scanning every gull, and going back to good spots, and checking Facebook in case anyone else had seen it, but no luck. Birders had seen the last of the Quincy, Illinois, Ivory Gull the day before. We had dinner before we cut out, and drove and drove and drove back to Tony’s place, getting there just after 2 am. I slept on his sofa and drove the rest of the way home Sunday morning, adding a pheasant and a couple of Rough-legged Hawks to my year list on the drive. In one day I’d more than doubled my 2015 list, added Eurasian Tree Sparrow to my Illinois list, and spent several hours in exactly the places where for over a week an Ivory Gull had flown and rested and fed. During those few hours, I may have been breathing in molecules of air that that Ivory Gull had breathed out. If I’m lucky, some day I’ll have another chance to chase another Ivory Gull. But I’m sure glad I at least tried to see this one. The Barnacle Goose, shown in my first edition Golden Guide. Last month, when I was in New York City, in Brooklyn, visiting my daughter, two species popped up on the national bird rarity list, only 50 miles away, in New Jersey: Barnacle and Pink-footed Goose. Both were birds I’d never before seen in the wild. If they had shown up 50 miles from Duluth, I’d have been in the car in a heartbeat. But driving in or out of New York City is not something I do easily. I am always tense by the time I reach my daughter’s place. I pull up in front of a fire hydrant, call up to her apartment, and her partner Michael parks the car for me. Then I try not to move it again until it’s time to head home. The Barnacle Goose is a species I first read about when I got my first field guides in 1974, but I never got fixated on seeing one because both field guides emphasized that it was an Old World species. When one showed up occasionally, usually in winter along the East Coast, it was simply an accidental stray. Barnacle Geese are strikingly beautiful, with a white forehead and face contrasting with a black neck and bill, and are often raised in captivity, so at least some North American records are probably of birds that escaped game farms or aviculturists. There are three non-overlapping populations of the Barnacle Goose: one nests in Russia and winters in the Netherlands and northern Germany; the Svalbard population nests in an island archipelago halfway between mainland Norway and the North Pole and winters on the Solway Firth in Scotland; and the population nesting in Greenland winters in western Scotland and western Ireland. 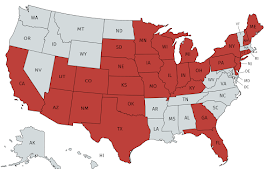 None of them belong in the United States or Canada, but they have occasionally been reported here. The first North American record was in 1867, when one appeared on James Bay in Quebec. Sightings were sporadic until recent decades, with marked increases beginning in the 1990s, probably coinciding with greater enforcement of game conservation laws in Europe. But as beautiful and rare as they are, and much as I’d love to add Barnacle Goose to my lifelist, I don’t feel any deep need to chase one even as close as 50 miles away—at least, not if the driving involves New York City. The brand new (2014) edition of Sibley shows the Pink-footed Goose. It's not shown in the first edition, from 2000. 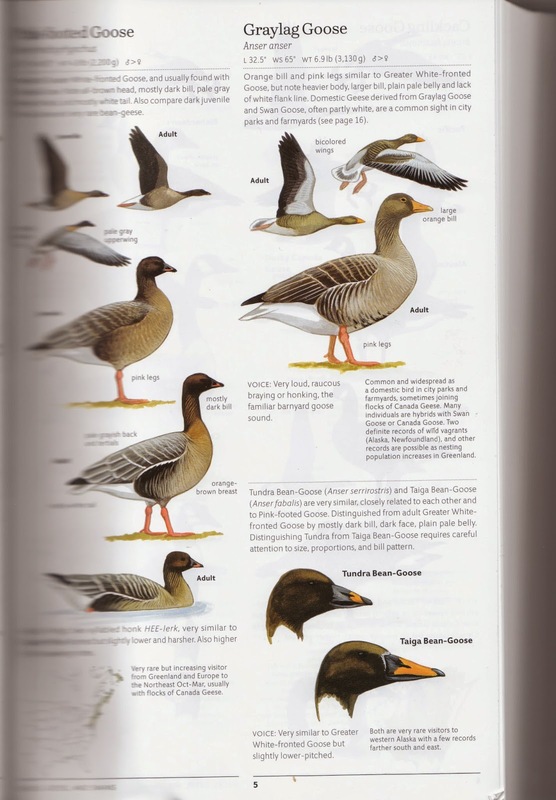 All six editions of the National Geographic field guide, starting in 1983, include the Pink-footed Goose. 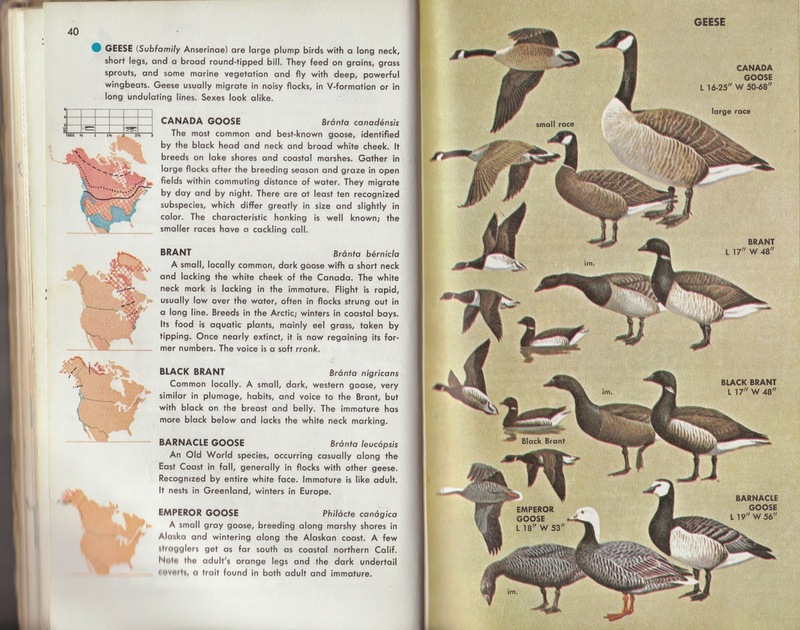 The Pink-footed Goose isn’t shown in any edition of the Golden or Peterson guides, because it had never been seen in North America when the first editions of those field guides were written, and was exceptionally rare until just recently. Except for its feet, the Pink-footed Goose is fairly nondescript, and not often kept in captivity in America. Its main claim to fame is its role in the book and movie The Big Year. When Sandy Komito broke the all-time record for a Big Year in 1998, as written about in Mark Obmascik’s book, the Pink-footed Goose Komito saw in Pennsylvania was a Code 5 species—the rarest classification—because fewer than three had been recorded in the previous 30 years. By 2004, there were 17 records of the species in the eastern North America, and one on in Washington State—the bird is now considered a Code 4, for birds that have been seen more than 3 times on the continent in the past 30 years but aren’t occurring annually, and soon may be downgraded on the rarity scale to a mere Code 3 because they seem to be turning up every year now. The movie The Big Year played with a lot of bird facts, and the oddest may have been its ending the year with Steve Martin and Jack Black’s characters seeing a Pink-footed Goose in Colorado, a state where none has ever been seen, in a tiny puddle in the snow, which could not possibly have furnished any waterfowl with food for any length of time. The Pink-footed Goose breeds in Greenland. One population winters in Great Britain, mostly in Scotland; the other population winters mostly in the Netherlands and Denmark, and also in Norway, northern Germany, and Belgium. Cool as Barnacle and Pink-footed Geese are, and as much as I'd love them on my lifelist, my dread of big city driving was larger than my hunger to see either, or even both together, so my car stayed in the same parking spot in Brooklyn until I left for home. There’d be no wild goose chase for me on that trip. Then, just last week, I set out on a journey an order of magnitude longer than a mere 50 mile trip would have been, just to see a gull. But my wild gull chase is a story for another day. In July 1998, I got a Bichon Frise puppy named Photon. 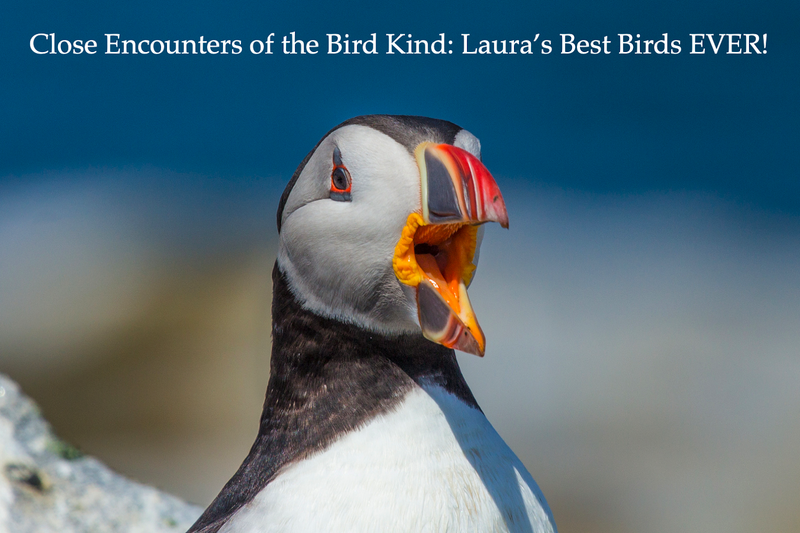 She instantly became my birding companion and plucky sidekick—she and I birded together in at least 31 different states and Washington, D.C., and I saw at least 450 species of birds with her at my side. She was 15 and slowing down by the time I did my big year in 2013 so didn’t get to travel with me for that, and she died last April. Birding has not been the same without her. Pip is the smallest one, on the right. I didn’t even think about getting a new dog for a while, but now I’m ready. 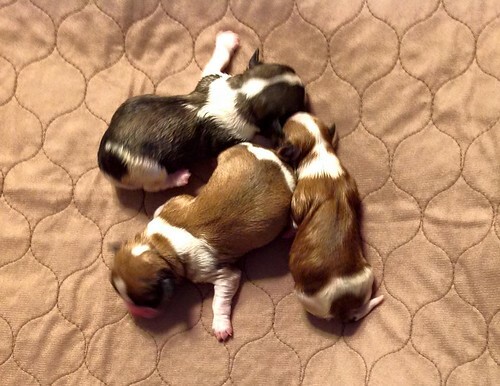 I'll be getting a female puppy on March 21. She's a Havana Silk Dog, the same breed as Charles Dickens once had, so I’m calling her Pip, after the main character in Great Expectations. 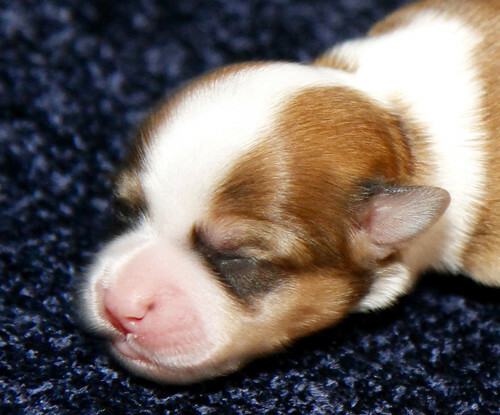 She was born on January 2, and the breeder sent me photos taken right after she was born and when she was two days old, and promises to keep me up to date. 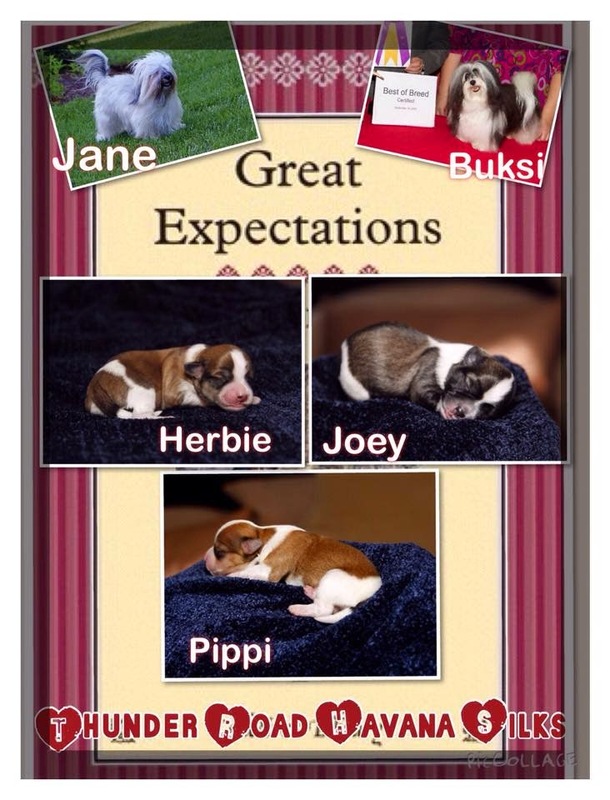 Her two litter mates are males, also named for characters in Great Expectations—Herbie after Herbert Pocket and Joey after Joe Gargery. Birding with a dog requires a lot of logistical planning. 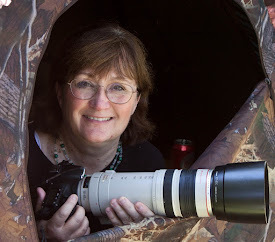 Before I knew I’d be getting her, I’d already agreed to speak in Kansas in April, at the two-day-long Wings N Wetlands Birding Festival, which is centered around two amazing birding spots—Cheyenne Bottoms and the Quivira National Wildlife Refuge. I’m not sure I’ll be able to bring Pip along to this. In May, when she’s a little further along in her training, I will be bringing her along to Trempealeau, Wisconsin, and to the wonderful birding festival in Ohio called The Biggest Week in American Birding—organizers from both of those gigs will be putting me up in their houses rather than a hotel so when I can’t have her with me, she’ll be safe and comfortable. 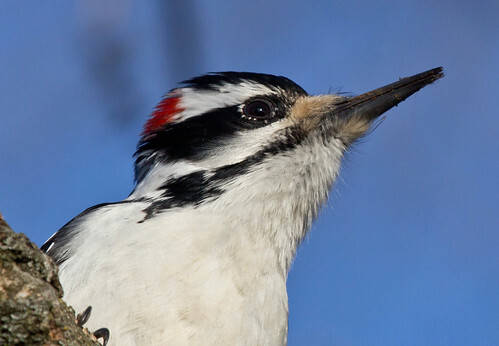 Many great birding spots forbid dogs, and with good reason. 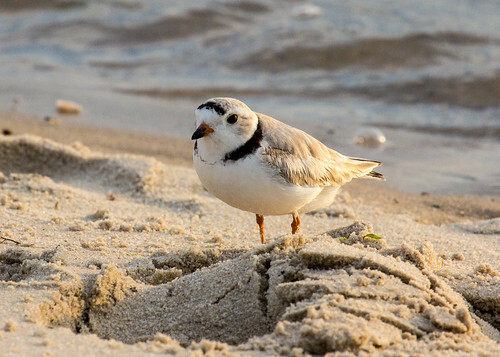 As fun as it is to play with a dog on the beach, that’s particularly dangerous where plovers or small terns breed—even the gentlest dogs and most benevolent owners present a danger when running through a nesting area where eggs look like little stones. And birds get stressed out when potential predators walk through their territories in any habitat, especially during the breeding season. I learned that first hand with Photon. Whenever we walked on a narrow path through the woods in spring or summer, warblers, vireos, and wrens would drop down to scold her. Neither she nor I meant any harm, but the birds couldn’t know that, and diverting them from more important activities wasn’t safe for them or their young, so when I had Photon along, I started limiting my birding to wider roads during the nesting season. 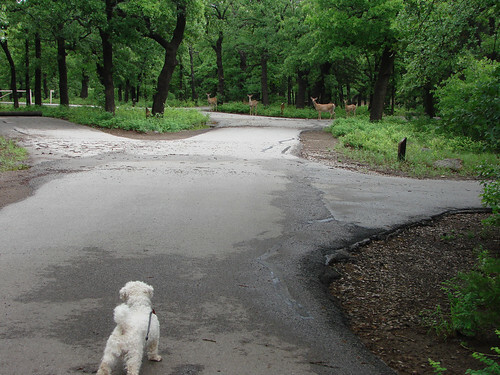 Photon never in her life chased any kinds of animals except white-tailed deer. I have no idea what she’d have done if she ever managed to get close to one—whether her goal was to bring it down or be best friends—but deer can easily bring down a little dog with a good swift kick to the spleen, so I never allowed her to get close enough to find out. Photon drew in a Bald Eagle at Crex Meadows once. The eagle circled over her, eyeing her carefully, but fortunately I was too close for the eagle to even try to attack. Photon also brought in a whole group of coyotes to my tent one night at a wildlife refuge in Arkansas. 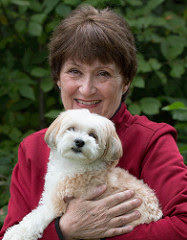 I always kept her on a long retractable leash—I’d hooked the handle to my belt with a carabiner, and drew her in any time I needed her close. I don’t know if Pip will find deer attractive, but as I did Photon, I’ll train her from the start to stick by me, and I’ll keep that retractable leash on her at all times anywhere outside of our fenced in backyard. It’s fun to think our dogs are perfectly trained and will instantly come no matter what, but I’d sure hate to learn otherwise the moment a bear appears on the horizon or a family of baby ducks waddles past. 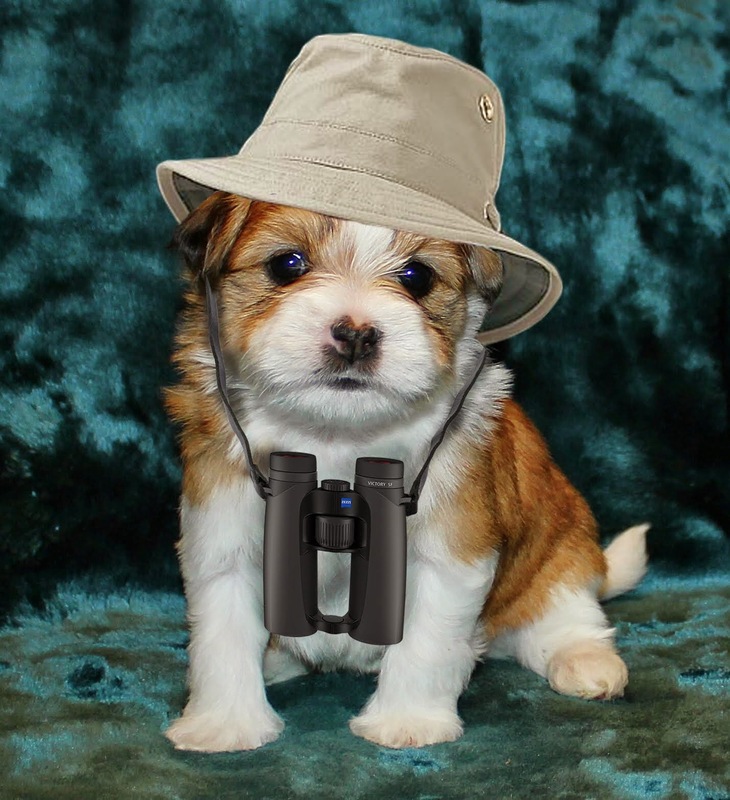 You don’t need a dog to go birding, nor do you need any other birding companion. But a buddy on road trips can enhance the experience, and a good dog will never tell you that you’ve misidentified a bird or argue about who spotted it first. A good dog may never help with driving, but will give you someone to talk to when you need to stay awake. And puppies are just so hopeful and fun. Winter always seems to last too long, and waiting for spring is always hard, but this year will be worse than usual. March 21 seems very far off when I’m so filled with great expectations.